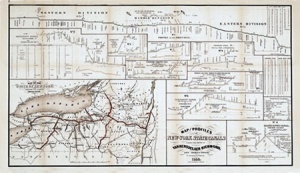 Printed on parchment stock, this official New York State historic map depict in minute detail the Erie Canal as originally built in 1825. It is eminently suitable for framing and permanent display in a library or study. Image size: 16.5” x 28”.